A "Must Read" for the small business owner, blogger, entrepreneur, executive or anyone else hoping to thrive in today's online world. Past versions are SOLD OUT! 3rd Edition is available now. Holly Berkley's latest Internet Marketing book inspires medium to small businesses to find ways to thrive in today's economy by introducing new low cost ways to compete with major corporations online. Small businesses have a few important advantages over the major corporations: speed, flexibility, passion and personality. In fact, these very traits that make small businesses special are what will help them thrive in todays online world. With the Internet boom of the mid-1990s came the end of corporate controlled media. The Internet revolution gave everyone a voice despite income, status or political views. It quickly took the small business beyond the boundaries of the neighborhood and allowed entrepreneurs with limited budgets to compete on a global level. However, it didnt take long before deep pockets and major corporations starting taking back a bigger and bigger piece of the Internet space. In early 2000 big businesses used their budgets to develop massive online co-branding campaigns and to push out flashy high tech ads across major web portals. They hired SEO agencies to optimize their web sites to show up at the top of Google, and the once cost effective Pay-Per-Click ad buys got too expensive for the small entrepreneur with a limited marketing budget. It seemed that the small businesses could no longer afford to keep up. Fortunately, today, with the massive growth of the social web (Blogs, FaceBook, YouTube, Twitter), the playing field is leveled once again. The social web allows even business owners and marketers with limited technical experience to post business updates fast and to communicate with customers efficiently  sometimes without ever picking up the phone or even opening up a storefront. The web is often referred to as the "great equalizer" a way that small businesses can compete with the fortune 500 companies. With the Internet increasingly becoming the new wave of business and communication, small businesses can no longer afford to ignore this channel. 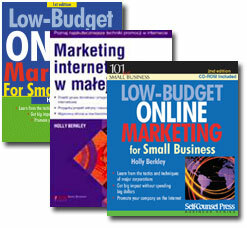 In Low-Budget Online Marketing for Small Business, Holly Berkley shows how with passion, vision, creativity and a game plan that small businesses can use to maximize their business potential.